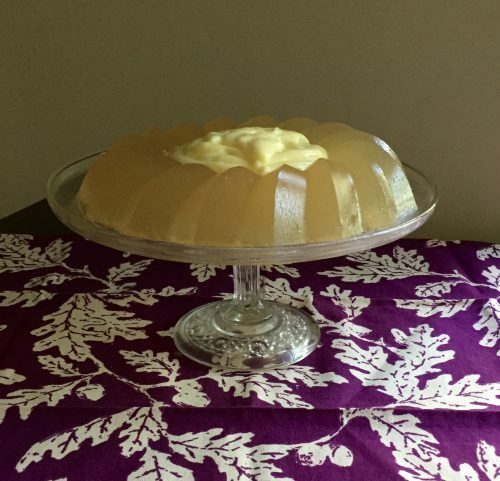 Author’s creation of Emma Schreiber’s “Apple Jelly for a Corner Dish” served with custard. “Boil 12 good juicy apples or more if not of a large size in a pint of spring water,” Emma Schreiber’s Apple Jelly for a Corner Dish, a recipe for a molded apple jelly served with custard, begins with a curious mix of specificity and ambiguity. 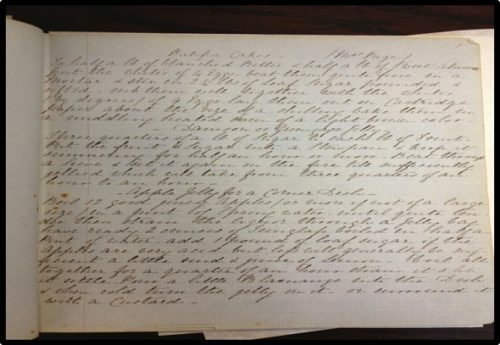 This recipe, from a manuscript recipe collection compiled in the Toronto area during the mid-nineteenth century is, seemingly, among the most complex in the collection, requiring a great amount of instruction and filling most of the page. The dish’s name references the growing significance of gentility in previously rural and isolate areas. Labeling it as a “corner dish” signals its placement on the table, balanced by a similar dish at the opposite corner. 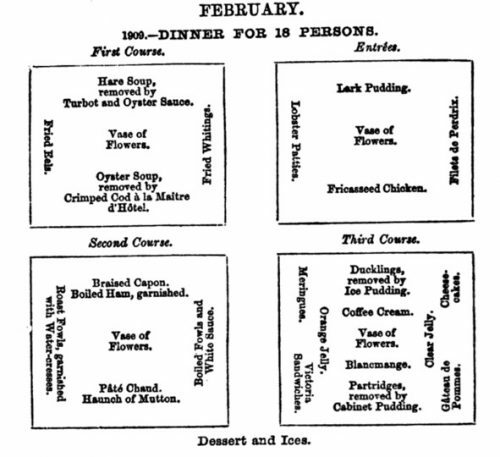 In the 1830s and 1840s, instructions for creating a pleasing tableau for a dinner or tea table became commonplace in domestic guides, such as the diagram below. The types of dishes and their placement on the table indicated the gentility and status of the hostess. 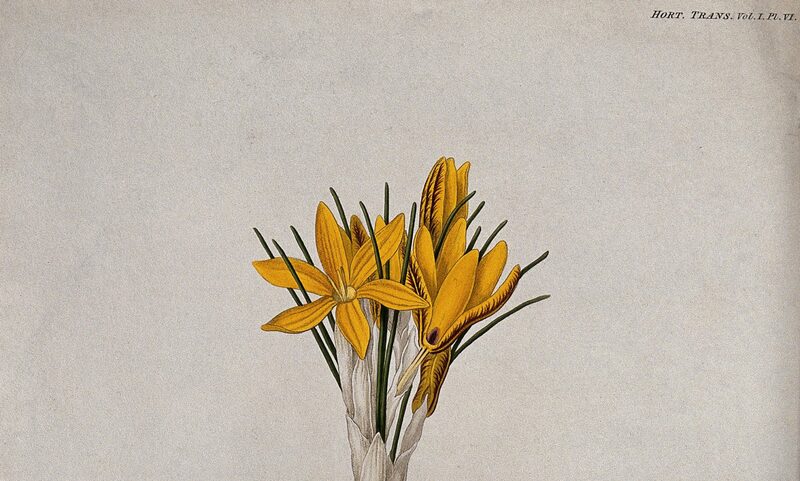 Schreiber’s recipe collections and related sources demonstrate the translation of the genteel lifestyle to a rural, agriculture-based transnational region focused on Lake Ontario. Much like the adapted recipe for Snowballs in the Frugal Housewife’s Manual, Schreiber’s recipe demonstrates shift in the types of recipes women collected and the focus of their domestic labor. This change is reflected in the growing emphasis on “fashionable dishes” that ornamented the tea or dinner table and had far reaching consequences for women’s household labor. Among these “fashionable dishes” were recipes like the apple jelly featured on the first page of Emma Schreiber’s recipe book. Early in my research process, I frequently experimented with the recipes I found in archival sources. However, writing deadlines, teaching responsibilities, and life changes left little time for culinary experimentation. 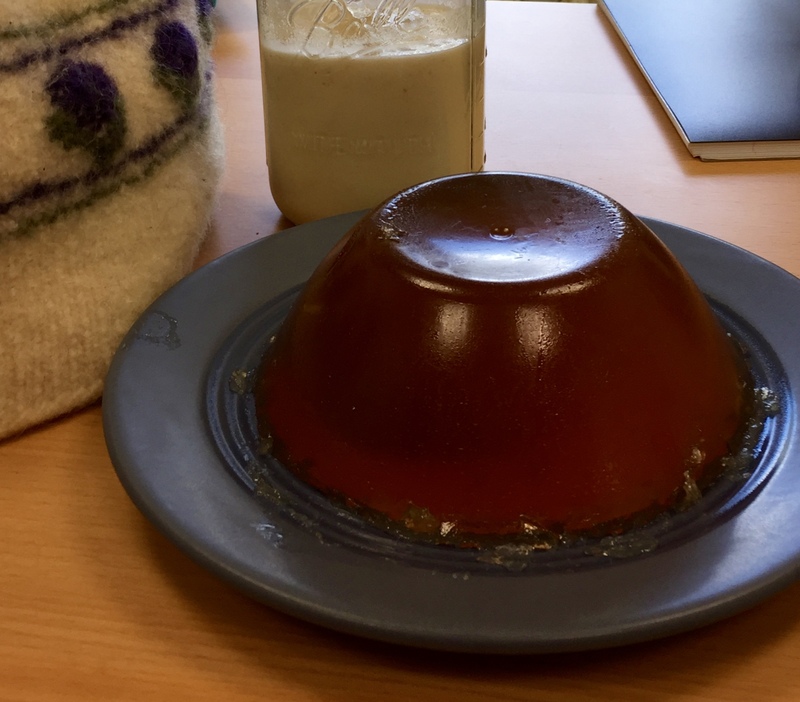 Although Schreiber’s recipe for apply jelly figures prominently in a chapter of my dissertation, I had never attempted to produce the recipe. Fortunately, contact with other researchers reminded me of the value of kitchen-oriented research. In Cooking in the Archives, Alyssa Connell and Marissa Nicosia translate early modern recipes for twenty-first century cooks. They argue, “these historical recipes belong in the modern kitchen – that they can and should be read and enacted as instructions, as well as studied as archival texts from a specific historical period. After all, what are recipes if not primarily instructions for cooking?” Inspired by Nicosia’s talk at the Manuscript Cookbook Conference at NYU, after three years of working with Schreiber’s recipe book, I determined to bring my work back into the kitchen. It proved to be transformative. Reading a recipe and following a recipe are, of course, two completely different acts. At my desk, I read recipes to uncover insights into women’s daily lives. I compared recipes from different sources, mapped women’s recipe sources, and tabulated the types of recipes in a collection. In the kitchen, I confronted new questions. What exactly constituted a juicy apple? How could one determine if an apple was sufficiently large? Should the dozen apples be peeled? Cored? Cut into small pieces? While I consulted more detailed recipes for apple jelly, I frequently had to rely on my best judgement. First attempt at Schreiber’s Apple Jelly. Second attempt at Schreiber’s Apple Jelly. Producing the jelly not only provided me with a new way to connect my students with my research, it also revealed new insights. Prior to my jelly-making efforts, I assumed molded jelly recipes like Schreiber’s were time-consuming and required great skill. 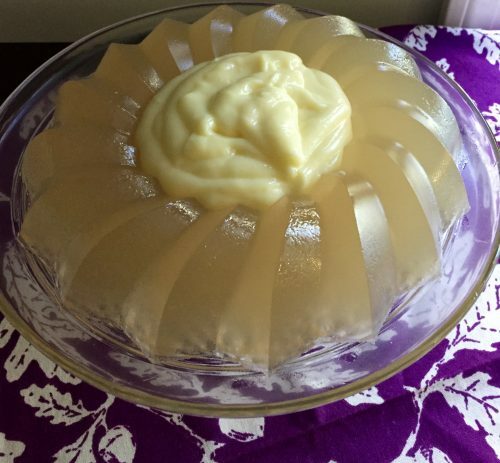 In fact, I poured my first jelly into a plastic container rather than a mold because I firmly believed it was a flop. But I was amazed by how easy the jelly was the prepare. I could easily imagine allowing the apple to simmer and the juice, thickener, and sugar to boil while preparing other dishes and pouring the resulting liquid into a mold to sit in a cool place until the next day’s dinner or tea. Schreiber’s recipe made molded jelly, a symbol of gentrified refinement, approachable for women who did their own cooking. The Lady’s Own Cookery Book, and New Dinner-Table Directory (London: Published for Henry Colburn, 1844), 221.